The first game of a basketball season rarely turns out as close and exciting as Wednesday's non-conference boys' basketball clash between the Kimberly Bulldogs and Wood River Wolverines, in Hailey. Wood River 6-3 junior wing Stone Sutton (25 points, 13 rebounds, 7-for-8 free throws, 4 blocked shots, two 3-pointers) had a career-best game helping the Wolverines dig out of a 10-point second-quarter hole. But Kimberly, despite ice-cold shooting against a tough Wood River zone defense after half, pulled out a 41-40 victory when the Wolverines didn't get the roll on a potential game-winning lay-up at the buzzer. Wood River coach John Radford said, "We played 10 kids in a tight game. For a first game, I was very proud of them." Sutton was Wood River's top scorer at 8.4 ppg as a sophomore last season, but he never scored more than 10 points on his home court. He tallied 16 points three times, at Hillcrest, at Canyon Ridge and at Buhl. Wednesday night, Sutton came out firing and scored 10 points with six rebounds in the first period alone. Kimberly's more balanced offensive attack was evident in the first eight minutes because five Bulldogs scored taking an 11-10 lead. But Wood River would have enjoyed the lead if its players made three easy chip shots off excellent movement in the motion offense. Radford said, "We had some nice backdoor cuts and did an OK job handling Kimberly's ball pressure." Kimberly had a dominant post player in 6-7 senior Derek Maloney (7 points, 12 rebounds, 3 steals) and coach Marvin Mumm's 'Dogs hammered the ball inside. They out-rebounded Wood River 12-8 in the first quarter, many of the boards coming on the offensive glass. Radford checked his clipboard to learn about Kimberly's shot selection and saw most were inside shots, close to the basket. He made the defensive switch from man-to-man to zone. It worked so well that Wood River used it successfully for the rest of the game. < Sutton scored Wood River's first 12 points, then four teammates led by Luis Chavez (3 points, 6 rebounds) contributed scoring in the second quarter. Turnovers (23 for the game, to Kimberly's 10) hurt the Wolverines and the 'Dogs went ahead 22-12. It was 29-24 at the half. The Wood River zone really starting doing damage in the third quarter. Kimberly scored its only field goal fully five minutes into the period. Radford said, "The kids were active in the zone and played it well." Held scoreless in the third, Sutton came to play with nine points in the final stanza. His end-to-end rush after a rebound by Quentin Dowdle (2 points, 5 boards, 2 steals) was finished with a dazzling reverse layup for a 35-34 Wolverine lead. Kimberly responded with five straight points before Sutton nailed his second 3-pointer. His team trailing 39-38 with two minutes left, Sutton had three Bulldog defenders coming at him when he took a pass from Alex Padilla (5 points, 4 boards, 3 assists) and somehow swished an 18-foot baseliner—taken from an angle virtually behind the backboard. The shot put Wood River on top 40-39. But Kimberly came right back with a basket by Jacob Howell (6 points) on a nice pass from Tevan Brady for the final Bulldog points with 1:31 left. Wood River had two excellent chances to regain the lead in the final minute—the first when Sutton drove the baseline and was hammered while just missing the layup. Suggesting that Sutton might have been fouled but it wasn't called, Radford said, "Stone was very aggressive and got to the basket for us at a key moment." Kimberly (18-for-29 free throws) shot 75% from the charity stripe in the first half but tired toward the end, making only 3-of-9 in the decisive fourth quarter. Two misses with five seconds left and a Sutton rebound gave Wood River one more chance to score. Sutton fired a length-of-court pass to junior reserve Mica Merritt, who had just entered the game when Kevin Jensen (4 points, 3 assists) fouled out. Merritt's layup looked good but just lipped out—and Kimberly breathed a sigh of relief. 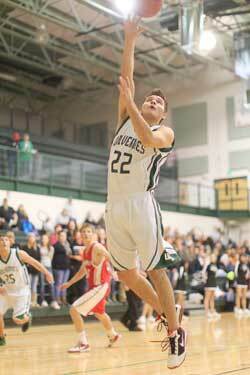 Junior Jake Vegwert (1 point, 5 rebounds, 2 steals) also had a good game for Wood River (12-for-17 free throws). The Wolverines ended up out-rebounding Kimberly 34-29, but the 'Dogs had 14 steals to just six for the Wolverines. Wood River (0-1) visits last year's State 3A qualifier Filer (1-1) today, Friday. Filer has played two 4A teams so far, winning 45-30 at Burley Wednesday night and dropping a close 54-50 road game to Canyon Ridge on Tuesday night.